After you learn that the average cost of a wedding is almost $26,000, you may feel pressured to skip your honeymoon. Weddings are supposed to be the best day of your life. You shouldn’t have to start your marriage worrying about debt. Although the cheapest way to get married is at the courthouse, most people spend years fantasizing about their wedding ceremony. The good news is that you can accomplish your dreams without the financial burden. If you want to learn how to save money planning your wedding, here are 15 must-know tips. It’s hard to imagine that a few dozen pieces of paper could cost hundreds of dollars. Many couples are shocked when they learn how expensive typical wedding invitations are. The world is digital now, which means you can do a lot of your wedding prep work yourself for free. The benefit of making your own wedding invitations is that you can design them to fit your unique taste. You can add your favorite pictures, color schemes, patterns, and text. These free invitations templates give you plenty of freedom to send them the way you’d like. You can print them yourself at home, in a print shop, or save them as an image to share online through social media or texting. Another popular, free way to send these invitations is through email. Instead of hunting people down to see if they got your letter in the mail, you can keep track of all your online RSVPs stress-free. Everyone feels love in the air when spring rolls around. Wedding venues know that warmer months are more appealing to couples, which means they can get away with charging you extra. The most popular months to get married are June through September. There are also spikes around major holidays like Christmas. If you’re willing to compromise, you can save big by choosing less popular dates. Another tip you need to know about choosing wedding dates is that Saturdays are the most expensive day of the week. Since most people have weekends off from work, it’s natural to pick Saturday. If your wedding is local, though, you can get away with planning a Sunday wedding for a fraction of the price. This tip may be the most difficult to heed because you don’t want to hurt anyone’s feelings. However, cutting one person could lead to hundreds in savings. Imagine how much you can save by trimming a list that has over a hundred guests down to a couple dozen. This may take some soul searching, but you have to be honest with yourself. Does the neighbor that you wave to a few times a week really need to attend the most intimate event of your life? While most people are sympathetic to wedding costs, some may take their exclusion personally. If anyone does express hurt feelings, you can apologize and explain that you can only afford a small wedding reserved for close family. Every woman can admit to admiring wedding dresses that cost as much as a car. Though it’s fun to imagine yourself in a designer gown, you can find equally stunning dresses elsewhere for much cheaper. Bridal and men’s wear shops shouldn’t be the only place you stop because of their luxury prices. However, it’s worth scanning their clearance racks to see if they have any steals. If you can’t find anything within your budget there, you have to get more creative. Thrift stores may not be the first place that comes to mind when shopping for wedding attire, but you can find high-quality clothes. There are also tons of other affordable retailers like H&M, Forever 21, and Charlotte Russe that have formal wear options. Many women have favorite types of flowers. However, if your top picks aren’t in-season during your ceremony, you’re going to have to pay a lot more. The reason why it’s best to shop local and in-season is because transportation fees are factored into your bill. If your flowers were grown in your city and picked that week, they won’t cost an arm and a leg. Local businesses are always grateful for your support. If you’re lucky, they may offer a discount. When you’re ready to start shopping for wedding venues, it’s best to avoid the obvious locations that are known for their receptions. Instead, you should consider hosting your wedding at a local park or another outdoor area. If you know a business that has beautiful outdoor scenery but doesn’t advertise wedding services, it doesn’t hurt to ask if they’ll accommodate your gathering. Another benefit of beach, mountain, or backyard weddings is that nature does the decorating for you. Although weather can be tricky to predict, an outdoor event can help you save big on venues and decorations. Instead of paying for an open bar with a bartender, your budget will fare better if you stock your own bar. You can choose your favorite alcoholic beverages and decide how much you’re willing to spend on each bottle. Guests will also enjoy the freedom of preparing their drinks exactly how they enjoy them. Keep in mind that not every person will drink. You can cut your bill further by providing non-alcoholic drinks like sodas and juices. DJs are fun, but they can come at a hefty price. With so many free or affordable music streaming apps, you can have an unlimited amount of music. Since you’re in control, you can also avoid any unsavory songs a DJ may have on rotation. Many providers use ads to keep their content free. If you want to avoid this, you can sign up for a free trial that offers full membership benefits. With this strategy, you don’t have to pay a cent and you can avoid ruining the moment with an unwanted ad. While it is possible to cut costs by baking a cake yourself and assembling finger foods, it’s ambitious to cook an elaborate meal for every guest. If your wedding is relaxed, you could consider serving cheap party foods like pizza. However, most couples want to have formal dinners prepared by experienced chefs. When communicating with local catering businesses, it’s important to state your budget from the start. Since catering is a competitive business, most companies will be happy to compromise to meet your budget. If you have a favorite restaurant in town, you can also ask them how much it would cost to feed the number of people on your guest list. Since local businesses appreciate support, they may throw in other freebies or upgrade the food at no additional charge. If you decide to book a wedding venue that offers all-inclusive packages, you should choose their least expensive booking option. While these pricier packages save a lot of stress, you do get overcharged for the convenience. Whether you’re planning a church, backyard, or country club wedding, it’s important to avoid going overboard with decorating. One of the best ways to save money is to go to a craft store like Michael’s and browse their clearance deals. You’ll be able to find lots of stunning décor that can be hung on the walls, set on the tables as centerpieces, and placed throughout the room to set the mood. You can also get creative with lighting. Even if your wedding isn’t during the winter months, you can use white holiday lights to add a magical glow. Not only are these lights cheap, but you may not have to buy any if you ask to borrow some from a few friends. Retail stores are known for being impersonal and expensive. Did you know that you can get customized, handmade wedding rings from private sellers on stores like Etsy? As long as you know your ring size, you can do all of your shopping online to find the best deals. Shopping as a couple can be a great way to bond and learn about your partner’s taste. You’ll also never have to step into a jewelry store and get pressured into buying the most expensive options. Wedding cakes are one of the most exciting parts about weddings. Everyone loves seeing excited newlyweds stand in front of a giant wedding cake. The sad fact about fancy cakes is that they can take several days to assemble. If you want to have an impressive cake display, don’t fret. This genius DIY idea will save you tons of time and money. If you stack tiers of Styrofoam or cardboard and decorate it like a cake, people will never be able to tell that it’s fake. With these expert wedding cake decorating tips, you can make cardboard look gourmet. If you want to take photos cutting your wedding cake as a couple, all you need to do is put a real layer of cake on top of the other tiers. Once the cake gets wheeled into the kitchen for plating, you can serve your guests cake bought from the store. If you shop at a wholesale retailer like Sam’s or Costco, you can get enough cake to feed all of your loved ones without breaking the bank. We’ve all been taught that talking about money is a taboo. Asking for cash instead of wedding gifts may have been unheard of a couple decades ago. In today’s world, though, more couples are struggling to pay for their weddings. This means that asking for financial help instead of an unwanted gift is no longer viewed as rude. Although the request may sound strange at first, many people will be happy to oblige. Gifting money is a lot easier than trying to shop for the perfect gift. Every wedding starts with an invitation, so it’s only appropriate to end it with a thank you. Composing thank you cards is a fun way to reflect on your special day. Your guests will also appreciate this gesture. These custom thank you cards are free and can be printed at home, in a print shop, shared as a high-quality image online, or sent through email. You only need a few minutes to create and send out a batch of general thank you messages. If you have more time, writing an individual thank you message can go a long way. 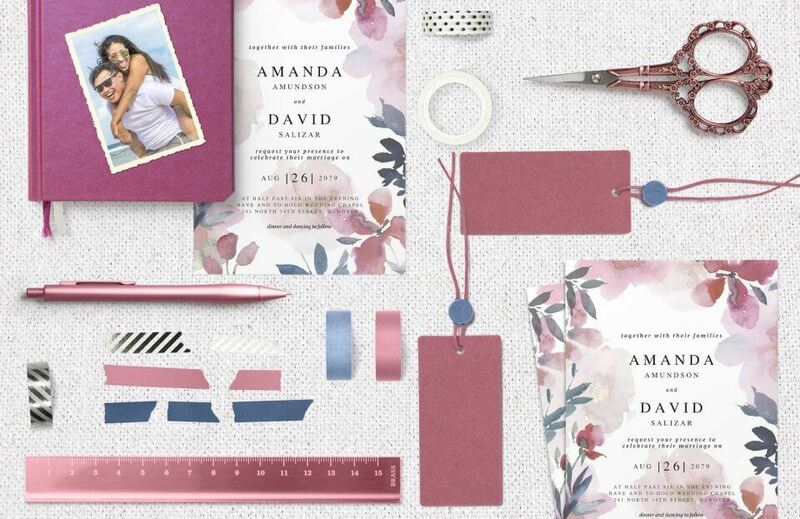 Ready to Make Memorable Wedding Invitations? Now that you know the top 15 tips on how to save money on your wedding, you can start planning. With a little creativity and foresight, you won’t have to sacrifice quality for cost. If you want to customize your own wedding invitations, Greetings Island would love to be part of your special day. 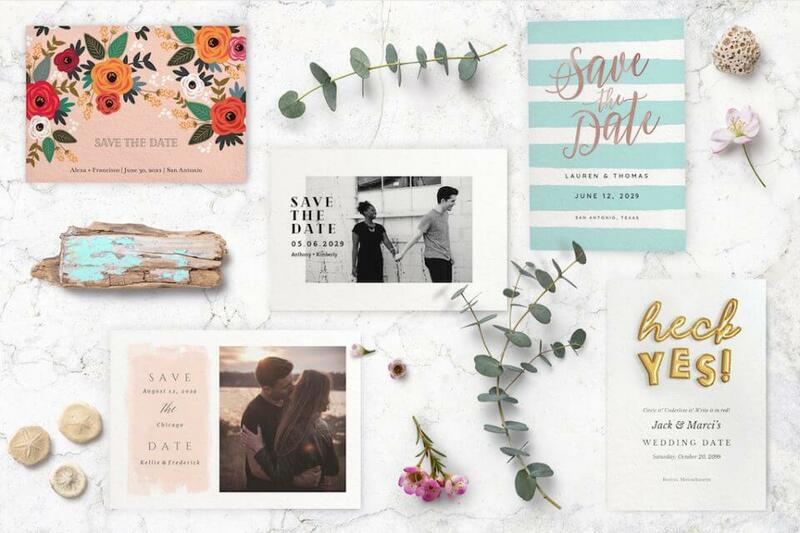 Check out our collection of wedding invitations & save the date cards. With so many unique templates available, you’re guaranteed to fall in love.